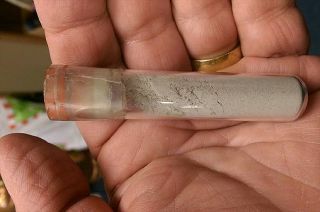 Laura Murray Cicco has sued NASA, claiming a vial of moon dust was a gift from astronaut Neil Armstrong. Cicco's mother told her the vial held "dust from the moon." According to her lawsuit, Cicco's father had been an Army Air Corps pilot who befriended Armstrong after moving to Cincinnati near the same time that Armstrong made history as the first human to walk on the moon in July 1969. Armstrong joined the faculty at the University of Cincinnati after he resigned from NASA in 1971. Almost 50 years later, Cicco has preemptively sued NASA "to settle ownership" of the alleged moon dust. The lawsuit aims to "remove a cloud on title" as pursuant to the federal Declaratory Judgment Act. "Astronaut Neil Armstrong gifted the vial of lunar dust at issue to Laura Ann Murray, now Laura Murray Cicco, when she was a child, and she is the rightful and legal owner of the vial and its contents," the lawsuit claims. "Therefore, she requests judgment declaring her the rightful and legal owner of the vial and its contents, and vesting title in her name." Cicco has retained Kansas City attorney Chris McHugh to represent her in the U.S. District Court of Kansas. McHugh previously represented an Illinois woman who successfully sued in the same court to gain ownership of a moon rock collection bag used on Apollo 11 and later mistakenly sold by the U.S. Marshals Service. That bag sold at auction for $1.8 million in July 2017. In April 2018, McHugh sent Cicco's dust-filled vial to a firm in Massachusetts that provides chemical analysis using X-ray fluorescence (XRF) spectroscopy and X-ray diffraction (XRD) spectroscopy. "The mineralogy is consistent with the known composition of lunar regolith," Tom Tague, applications manager for the Bruker Corporation, wrote to McHugh. Tague's tests, though, suggested the sample was from the "anorthositic highlands and not the basaltic lunar mare," he wrote. Armstrong landed in Mare Tranquillitatis or the "Sea of Tranquility." It was not until later that missions landed at and returned samples from the lunar highlands. Further, the XRF analysis revealed the dust was similar to the "average crust of Earth." "We conclude that the chemical composition of the sample is not consistent with lunar regolith," added Tague. In his conclusion, Tague explained that it might be possible that some dust from Earth had mixed "with this likely lunar sample," but acknowledged that was speculation. Cicco's filing postulates that "one possible explanation" is that the contents of the vial "were vacuumed or otherwise collected from the spacesuit of an astronaut who operated on the moon." Laura Murray Cicco's moon dust vial came with one of her father's business cards signed by Neil Armstrong. The astronauts were not permitted to keep loose samples of the material they returned from the moon. In 2012, a law was passed to clarify the rights of Apollo-era astronauts to retain the spacecraft hardware they kept as mementos, but it explicitly excluded "lunar rocks and other lunar material." According to NASA, no individual has ever been gifted or awarded Apollo-gathered moon rocks or dust. The agency retains control over the lunar samples that the six landing missions collected, loaning them out for study, educational outreach and museum display. The only gifts remain sets from the first and final landings, Apollo 11 and Apollo 17, presented as goodwill gestures to foreign nations and the U.S. states. A separate 2014 case cited by McHugh as the standing for Cicco's lawsuit recognized NASA's contention "that private persons cannot own lunar material." McHugh argues there is no law against private persons owning material from the moon, that it is "not contraband," and "not illegal to own or possess." Cicco's lawsuit does not include an explanation for how or why Armstrong came to have the alleged moon dust to gift to her. Armstrong died in 2012 at the age of 82. The suit, filed on Wednesday (June 6), has been assigned to District Judge Eric Melgren.